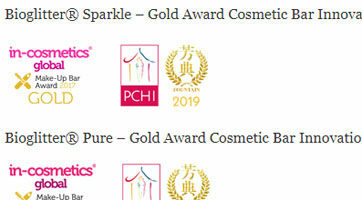 Our Bioglitter® products have the Gold award for innovation at in-cosmetics global in two consecutive years. We are especially proud of this achievement as it represents a first for any cosmetic raw material manufacturer. This year we were awarded the accolade of ‘Green & Sustainable Fountain Award Winner’ at the PCHI China.